Originally destined for private devotion, this panel – still unknown to scholarship – can be unhesitatingly attributed to the Master of the Fiesole Epiphany, a prolific anonymous artist who was active in Florence during the last quarter of the fifteenth century. In reconstructing his oeuvre, the late Everett Fahy clearly recognised its essential traits, based on the styles of Domenico Ghirlandaio, Cosimo Rosselli and Jacopo del Sellaio. In particular, the Virgin’s magnetic, wide-eyed gaze, directed at the beholder, is almost identical to that of Saint Vincent Ferrer and Christ in the altarpiece with the Volto Santo of Lucca surrounded by Angels and venerated by Saints Vincent Ferrer, John the Baptist, Mark and the Blessed Antoninus in the Los Angeles County Museum of Art, similar also for the Flemish-inspired touches of light moistening the coloured irises of these figures. Saint John’s red mantle with a yellow lining, which in our painting reveals an underlying green tunic, is the same as the one draping the body of Saint Mark with ample folds in the Los Angeles altarpiece, where we find further similarities in the finely-drawn hands, articulated fingers, fleshy fingertips and small nails. The Volto Santo panel, unquestionably the painter’s masterpiece, was recorded by Giorgio Vasari when it stood over the altar of the Silk Weavers’ Confraternity – known as the Compagnia della Santa Croce – in the Dominican church of San Marco, and is datable to the beginning of the 1480s. This was the period when the Master of the Fiesole Epiphany was collaborating with David and Benedetto Ghirlandaio in the Oratorio di San Martino, executed after drawings by their brother Domenico, a project that was in progress in 1481. Our master’s hand can be recognised in the Dream of Saint Martin, in which Christ, standing in the middle of the scene, recalls the Evangelist in our Pietà, a youthful type with loose, wavy hair and fleshy lips. The composition of our panel, pivoted around the centrally-placed foreground figure of Christ, who is seated on the edge of the sarcophagus, recalls that of the Dead Christ in the Galleria dell’Accademia in Florence, from San Girolamo alla Costa, and its twin in the Zamek Królewski na Wawelu in Cracow, both painted by the Master of the Fiesole Epiphany. In the panel in Cracow, the figure of the Virgin (which could be superimposed on ours), the anatomy of Christ, and the facial features of the Evangelist present strong echoes of the painting of Jacopo del Sellaio. Jacopo’s idiom would always underlie the style of our Master, emerging more clearly in works such as the Trinity in the Villa La Quiete altarpiece and the God the Father among Saints in the Museo degli Innocenti, and in our Pietà, making it probable – though not yet demonstrable – that this anonymous hand can be identified as that of the Florentine painter Filippo di Giuliano di Matteo, an idea formulated by Everett Fahy and enthusiastically adopted by Anna Padoa Rizzo. Filippo di Giuliano is recorded as “compagno” of Jacopo del Sellaio in 1473 and again in 1480, sharing Jacopo’s workshop in Piazza San Miniato fra le Torri. Moreover, Jacopo himself painted private devotional paintings that offer close compositional parallels with our work, such as the Pietà in the Hermitage Museum in Saint Petersburg. Compared with the panels in Florence and Cracow, the position of the Virgin behind Christ breaks the symmetrical arrangement with a more accentuated rhythm. 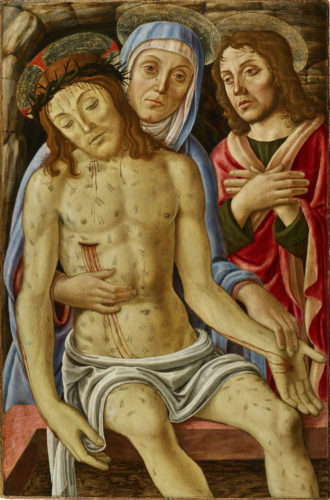 The whip marks on the body of Christ lend our painting a more empathetic and emotional mood, further stressed by the pale tonality of the flesh passages and his almost entirely closed eyes. His rounded face and broad forehead already look forward to the strong facial features of Saint Francis and the Virgin in the artist’s namepiece in Fiesole, originally painted for the monastery of the Murate in Florence after 1488, probably around 1490. Our panel can therefore be dated to the mid-1480s, midway between the altarpiece in the Los Angeles County Museum of Art and the Epiphany in Fiesole.